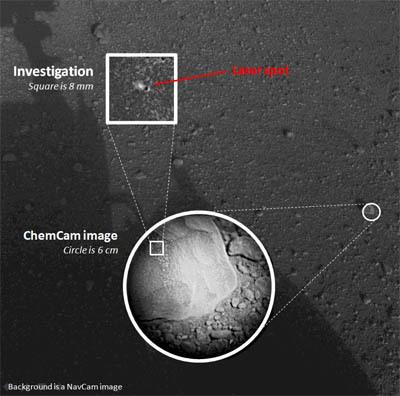 The Curiosity rover successfully test fired a powerful laser at a nearby rock Sunday, blasting it with rapid-fire million-watt pulses that vaporized the outer layers for spectroscopic analysis. 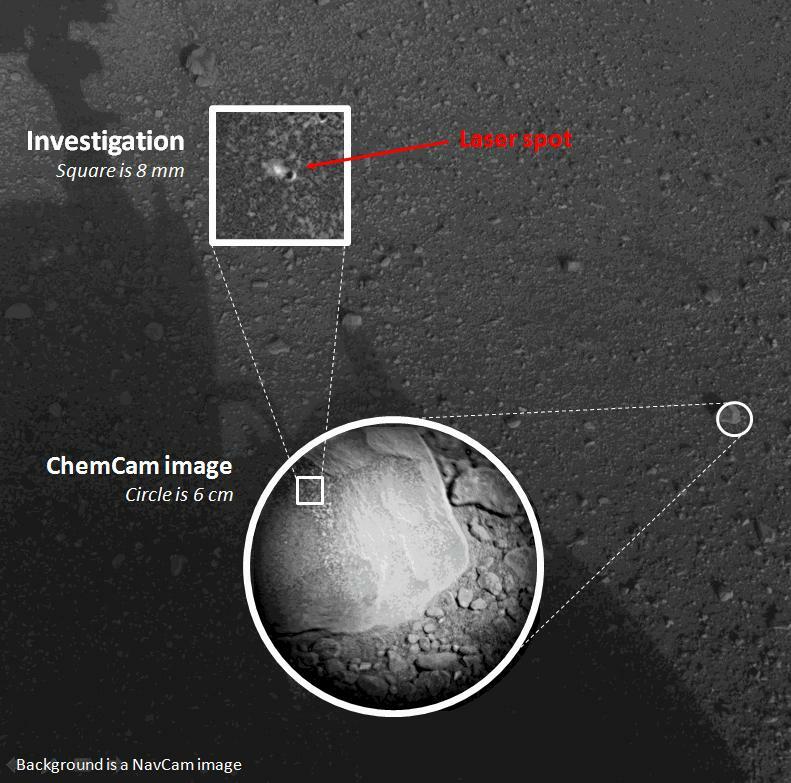 The Chemistry and Camera instrument, known as ChemCam, hit the target rock, dubbed "Coronation," with 30 pulses of laser light over 10 seconds, according to a NASA update. Each pulse lasted about five one-billionths of a second. The laser beam created a visible spark of electrically charged plasma that was then observed by the instrument's telescope. The telescope, mounted on Curiosity's camera mast, fed the light through optical fibers to three spectrometers designed to record 6,144 different wavelengths of infrared, visible and ultraviolet light. In a before-and-after image released by NASA, a tiny spot could be seen in an 8-millimeter by 8-millimeter frame that showed exactly where the laser beam hit. "We got a great spectrum of Coronation, lots of signal," Roger Wiens, the ChemCam principal investigator at the Los Alamos National Laboratory, said in a NASA statement. "Our team is both thrilled and working hard, looking at the results. After eight years building the instrument, it's payoff time." Deputy project scientist Sylvestre Maurice of the Institut de Recherche en Astrophysique et Planetologie in Toulouse, France, said he was surprised "the data are even better than we ever had during tests on Earth." "It's so rich, we can expect great science from investigating what might be thousands of targets with ChemCam in the next two years," he said. 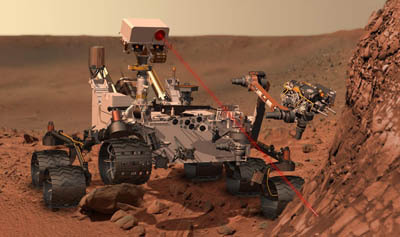 Laser-induced breakdown spectroscopy is a technique used on Earth to study the composition of targets in extreme environments. NASA said the tests Sunday in Gale Crater on Mars marked the first time the technique has been used on another planet. While the test was primarily intended to help the science team characterize the complex instrument's aiming and performance, the data generated may provide immediate insights. Scientists plan to look for possible changes indicating differences between dust on the surface of the rock and its interior. ChemCam was designed and built at Los Alamos and is a joint project between the U.S. Department of Energy and the French national space agency. It is one of 10 state-of-the-art instruments making up Curiosity's science payload that will look for carbon compounds and signs of past or present habitability during the rover's planned two-year mission.